Semantic Web technologies rely on interlinked data. With PoolParty, you have a powerful solution to develop a semantic layer to put all your digital assets in order. By linking your data repositories you avoid resource-intensive migration projects. With interlinked digital assets you improve your search and personalization applications. PoolParty Semantic Suite is easy-to-use and a learning system. The more you use it, the better its algorithm will become. With PoolParty, you build a knowledge graph that structures and represents your prioritized knowledge domains. 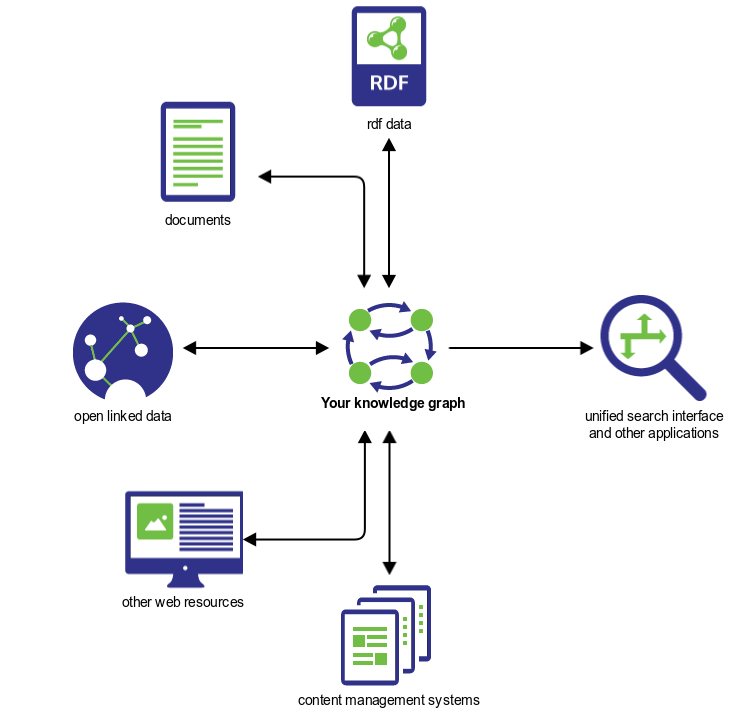 With Linked Data Management, you connect digital resources along the knowledge graph. Assets can be linked in multiple ways. In each linking scenario, they will have an unique URI (=Uniform Resource Identifier). You have tools that support you in creating a semantic network in an automatic way. PoolParty Semantic Suite is easy-to-use. Also Subject Matter experts can start linking data repositories with minimum training. The semi-automatic Linked Data approach guarantees efficient and high quality work. Linked Data is W3C standards-approved. You have no vendor lock-in, when using PoolParty Semantic Suite. Thanks to PoolParty API, we/you can customize PoolParty Semantic Suite for every available CMS and collaboration platform with low effort.